Welcome to our shop! We offer a few different options when checking out. 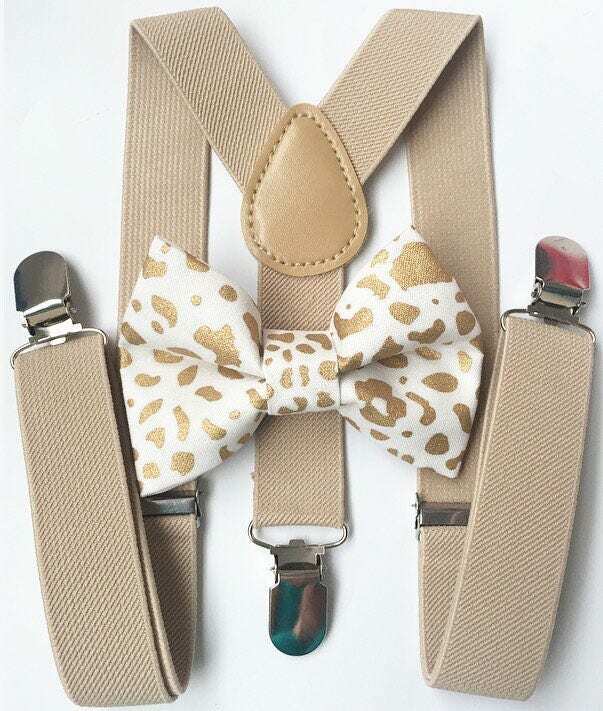 You can choose to purchase just the bow tie, just the suspenders, a bow tie and suspenders set or a daddy and me set. All Bowties come on an ALLIGATOR CLIP. You can add the “neck strap add on” to your order to make the bow tie on a black adjustable strap instead of an alligator clip. White Elastic Strap available upon request. Bow Tie will come on an alligator clip unless a strap add-on is purchased. Highly stretchable!! SILVER suspender clips that are easy to open. Y-back suspenders of high quality elastic. Adjustable Clip and Elastic straps for you to adjust the length. Small SET comes with a small size bow tie and small size suspenders. Adult SET comes with ADULT size bow tie and large suspenders: PLEASE NOTE: Adult Set BEST FITS Adult up to 6 FT tall and no more than 200lbs. Daddy and Me SET includes a matching pair: ONE Adult SET and One Kids SET. PLEASE Specify CHILD'S AGE for the daddy and me set when checking out. Made in a pet free and smoke free home studio. Lovely for any occasion; holiday, party, wedding, or any other occasion you want your baby, boy or man to look extra handsome for. I purchased this for my 6 month old son. It fit him perfectly! We accept PayPal, all major credit cards (Visa, Mastercard, American Express, Discover) and Etsy Gift Cards. Payment must be received before an order can be made and shipped out to you. Customer satisfaction is our main goal! Any questions or concerns, please contact us! We will work with you to resolve any problem that may come up. Every situation is handled case by case. Since each product in our shop is made to order, we do not accept returns. If it based on an error WE made (wrong product sent), You will be reimbursed for total purchase price INCLUDING shipping both ways. This policy does not include "buyers remorse" getting a product and then changing your mind. Once your package has been shipped and scanned in by USPS, we no longer hold responsibility for it. We cannot issue refunds for packages that are lost in transit, delivered late and/or are not delivered. Please contact your local post office to resolve any issues with undelivered packages. Most items ship within 1-5 business days. If you need a rush order, please let me know and we can work on getting it made and shipped out faster for you. Custom orders can take up to 3 weeks to create. We ship through USPS First Class Mail. Please allow 3-5 days for delivery after your order has been shipped. International shipping normally takes about 2 weeks. We are not responsible for international customs fees. You will receive a confirmation email with a tracking number as soon as your order has been shipped. Never leave a young child unattended while using our products. They contain small parts and could potentially become a choking hazard. We recommend that you never leave your child unattended while wearing our products. Our products are for use at your own risk. By placing an order you agree that Bow Tie Fun accepts no liability for use, misuse, or lack of supervision while using our products.